Kayapo Prowess: Defending the rainforest from deforestation without even an iPhone. A picture may be worth a thousand words but what if the picture is misleading and the words are inaccurate? Attracting the attention of world leaders and experienced conservationists is difficult in the middle of a rainforest. Photos can help, which is all the more reason for them to tell the true story of the Kayapo. Chief Raoni greets a friend. Photo by Martin Schoeller. When we left off last week, we had just begun to discuss the Kayapo’s incredible ability to leverage traditional skills and knowledge to defend their home and the rainforest from an amoral and technologically advanced foe. Given that information, few things could be more certain than the courage, resolve, and strategic sophistication of the Kayapo people and their leader, Chief Raoni. That is why, this picture, which made its way around the Web a few years back is so puzzling. And if, indeed, you are asking questions, then congratulations! You have been paying attention. After all, it would not be unreasonable to assume that the organization of the defense of a remote region of dense tropical forest from criminal networks hell-bent on profiting from its destruction is not a mission for the faint of heart, regardless of experience level or availability of resources. That the Kayapo are accomplishing this without the benefit of satellites, helicopters, roads, computers, or even a rotary dial phone would be considered by even veteran conservation professionals as nothing short of extraordinary. In terms of real-life David-versus-Goliath scenarios, you don’t get much pluckier than Raoni and his 8,000 tribesmen. So you are excused for thinking that Chief Raoni’s tears are a little out of character. Because they are. In fact, Raoni was crying for an entirely different reason. Just as it is customary, in Kayapo culture, to resist industrialization tooth-and-nail, it is also customary to cry when being reunited with relatives after a long absence. It’s almost like a greeting card, only Kayapo-style. And that’s precisely what Chief Raoni was doing in this picture. And if we all lived by such words, how might the opportunities of our world shift toward a sustainable relationship with nature? I bet Chief Raoni would have a thing or two to say in answer to this question. So how exactly are the Kayapo defending the rainforest and their traditional home? Hint: They aren’t doing it alone. Raoni knew that the outside world was not without its attractions. His people would have difficulty resisting the short-term gains, like medicine, radios, and modern creature comforts, that would ultimately lead to the permanent demise of the Kayapo culture and their stewardship of the rainforest. The survival of his people and the rainforest depended upon uncovering a solution that allowed the Kayapo to experience incentives for preserving their culture and defending their traditional lands. He also knew that if he was to succeed in uniting 35-50 villages across 11 million hectares of overgrown tropical forest without the assistance of wifi and Google Maps he was going to need to outside help. And that is how Barbara Zimmerman, Director of the Kayapo Project, found herself in 2008 on a plane to the 8th World Wilderness Congress in Anchorage, Alaska seated beside Megaron, a Kayapo leader in full tribal regalia. Megaron would address an audience of 1,500 professional conservationists from all over the world, and share with them an invitation to help his people. Through the help of the WILD Foundation and its World Wilderness Congresses (WWC), the International Conservation Fund of Canada (ICFC), and the Environmental Defense Fund, the Kayapo have been able to draw the attention and resources of outside NGOs, demonstrating that with support, Indigenous people are the best stewards of the land, and the strongest line of defense against deforestation. 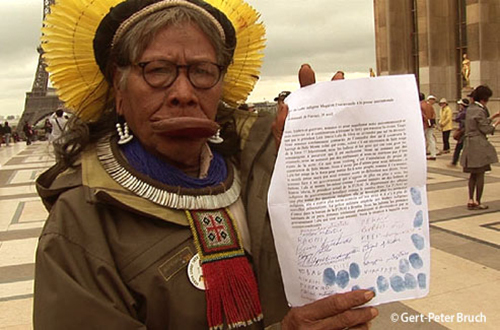 So what are these groups doing on a day-to-day basis to assist the Kayapo? Tune in next week to find out.